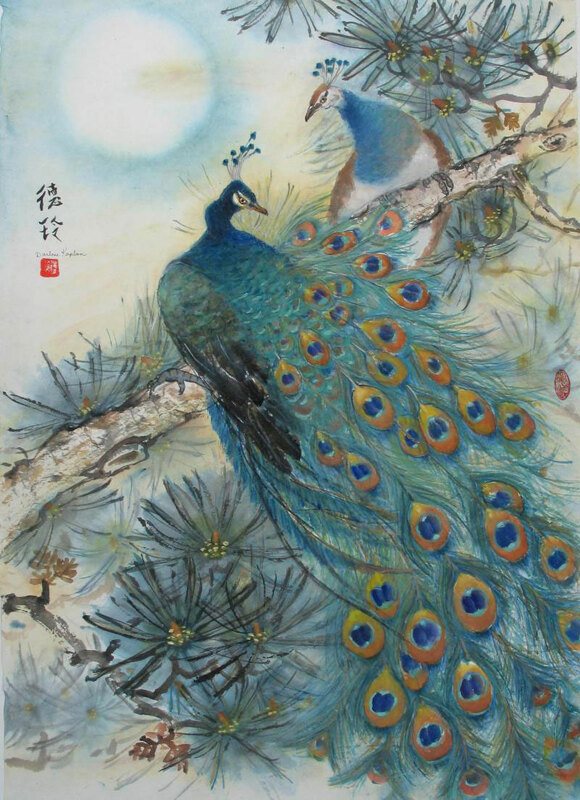 Oriental brush painting is one of the oldest continuous art forms in history. Some of the earliest practitioners were highly disciplined monks trained in the art of concentration, clarity, and simplicity. Special brushes, techniques, inks, colors and papers are required. One of the distinctive characteristics is the use of an inscription or seal which consists of the artist’s name and the date, which is considered an integral part of the painting. All of Darlene Kaplan’s extraordinary nature-inspired art is derived from life — never from photographs. Darlene Kaplan has won numerous awards for her paintings, including having her art recently selected by Lilly Wei, art critic for Art in America magazine for the Manhattan Arts International “Celebrate The Healing Power of Art” exhibition. She has had many exhibitions including those at Ratner Museum, Bethesda, MD and Bodzin Fine Arts Gallery, Fairfax, VA, among others. She is represented in the curated Manhattan Arts International Featured Artist Program. 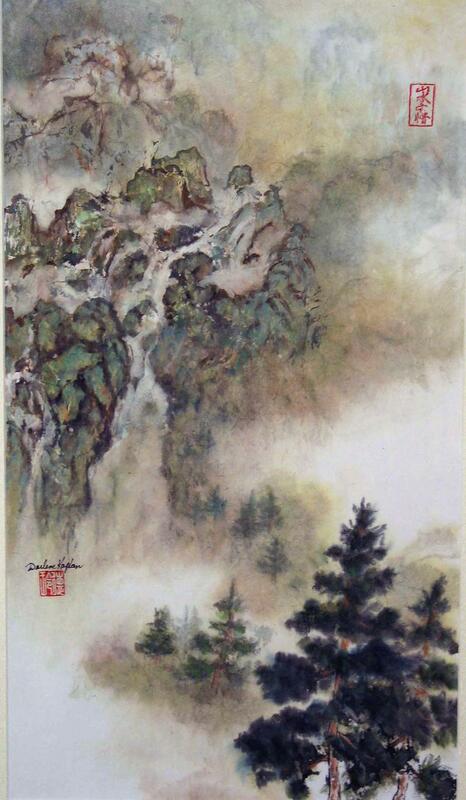 Her art is in numerous collections worldwide. RP: What are your earliest childhood memories that inspired your art? DK: I grew up in the country in Tennessee and all of my spare time was spent walking in the woods searching out bugs, plants and anything else that was alive. Those childhood days spent with nature is brought alive every time I put a brush stroke down on paper. 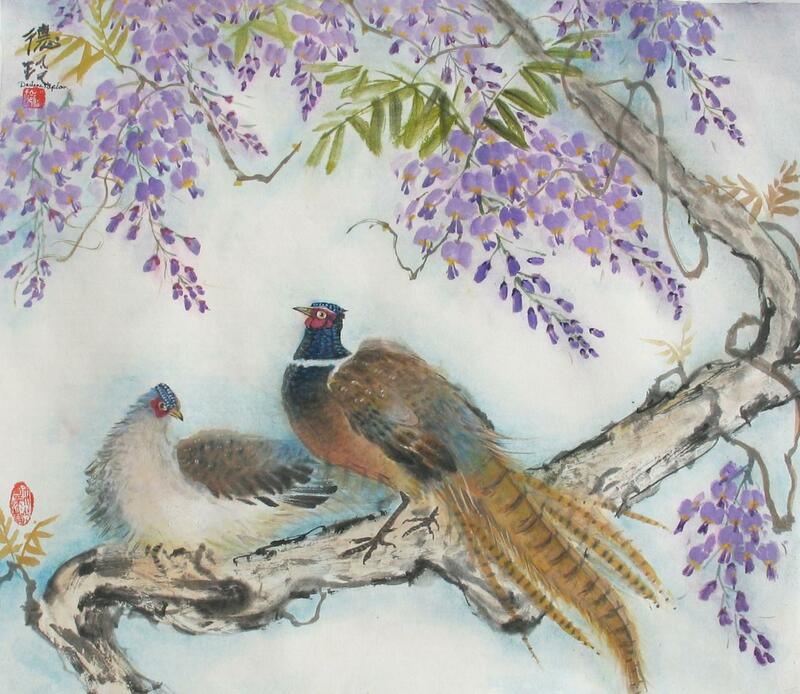 All of my paintings are derived from nature. RP: How do you begin a painting? DK: Before I begin a painting, I have a vision in mind. The mind has the plan and the hand follows. Once started, the brush and ink require full attention. The calming effect of grinding the ink before painting, the energy that is put into throwing ink on paper is just the greatest of pleasures that only this style of art allows me to feel. Without the mood, brush and ink do not have anything to attach to; without brush and ink, the mood cannot be expressed. These are inseparable elements. RP: What is your intention as an artist? DK: I believe that an artist is a person who can see something within the mind that can be brought into reality where it can be enjoyed by all of the senses. I strive to express the purity of snow, the brightness in the moon, the fragrance in the flower, and the sound in the waterfall. 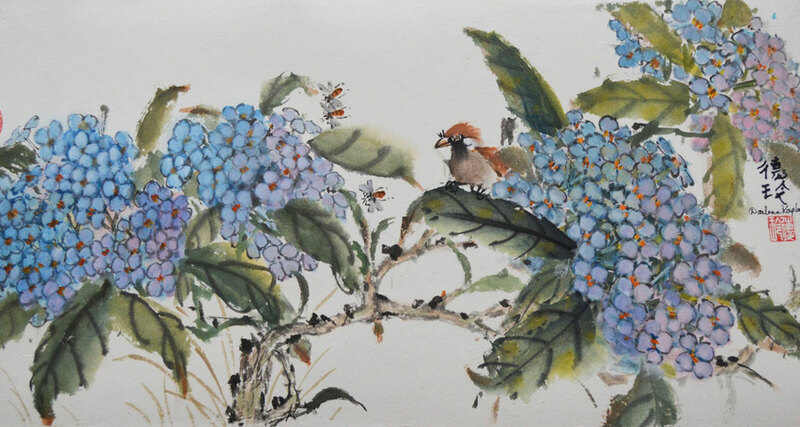 I think of my art as part of Chinese medicine which constantly uses Yin and Yang. It is relaxing yet focused, serene yet energetic; always creating the movement in the art that calms the heart and relaxes the mind. RP: Darlene, where can we see your art work now? 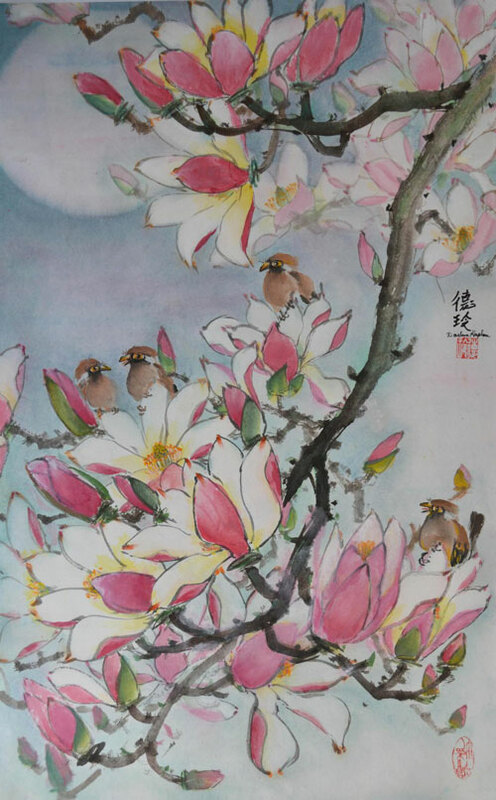 DK: My Oriental Brush Paintings are on view in Building 16 at the Workhouse Arts Center, Lorton, VA, and at my Soft Brush Studio in Alexandria, VA.
RP: Can you tell us about your Chinese Tea Tastings? DK: I present Chinese Tea Tastings, Gong Fu Style in my studio. This ceremonial tea drinking style is meant to focus one’s attention and relax the mind and spirit in a convivial, shared experience. Guests are served up to 8-10 different Premium or Estate Teas that include Oolong, Pu-erh, Green, White, Organic, and Blooming Tea, among many others. These teas come from around the world: Sir Lanka, Japan, China, Tibet, India, Vietnam, Taiwan, and other origins. Guests learn how the tea is harvested, what makes tea green or black, and the many health benefits of tea. For example, Pu-erh has been medically proven to lower cholesterol. They also learn how to steep each tea for maximum flavor. RP: When is your next workshop? 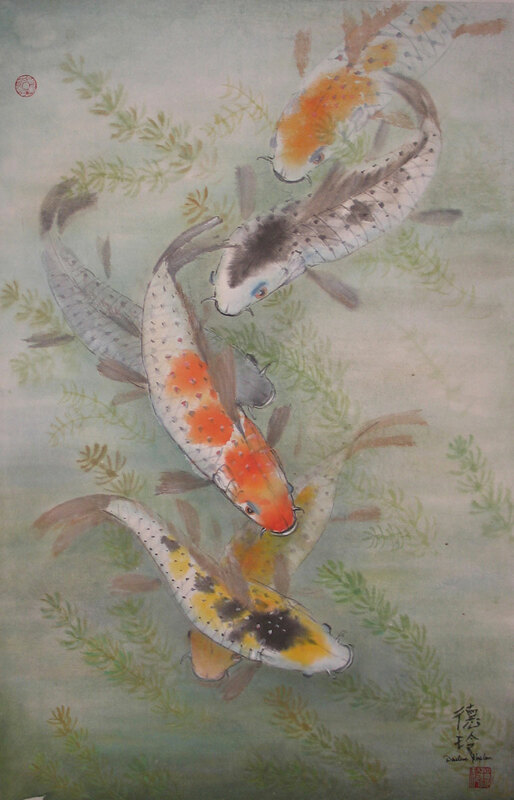 On Darlene Kaplan’s website, you can watch a YouTube video of her step-by-step painting demonstration of Japanese Koi. It was produced as part of her appearance as a guest of Charles Mills from the Virginia Time Travel, TV channel 10 & 69. 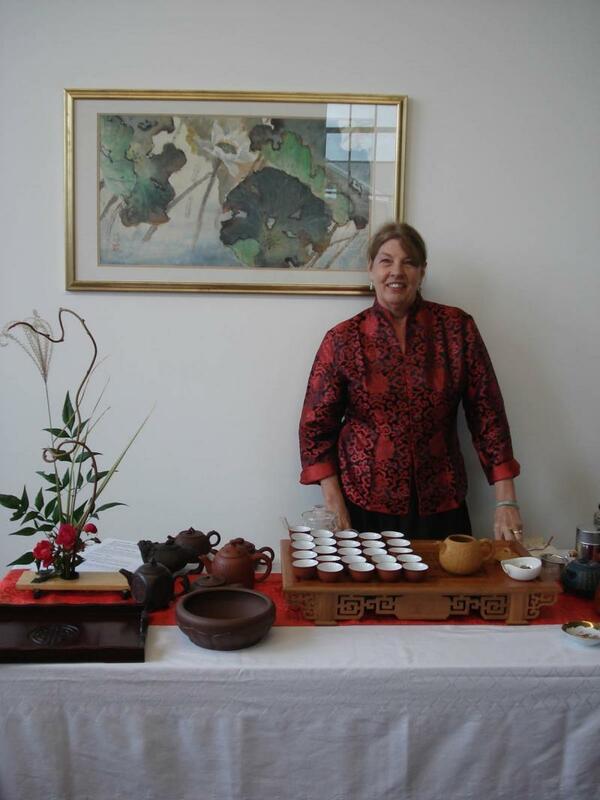 Information about Darlene Kaplan’s art, workshops, group ceremonial tea tastings and more may be found on her website: http://www.darlenekaplan.com.